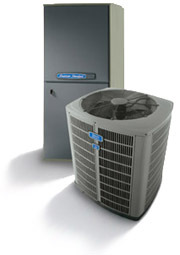 Minutemen Heating & Cooling is an authorized American Standard and Amana Dealer. We will always help you decide what equipment is right for you and take extra special care to properly size your heating and cooling equipment based on your size and efficiency needs. We are pleased to announce that we have began providing our customers with the option to purchase home air purification systems. This new and exciting product not only cleans the air in your home, but it also eliminates odors like smoke and pet smells, and reduces contaminants on surfaces such as countertops and door handles. In recent studies, bacteria and mold has been seen to be reduced up to 99.9% on surfaces. Since families spend much of their time indoors, everyone can benefit from this product. Call us today to find out more information and to inquire on trying out a unit in your own home. We look forward to speaking with you!